URM buildings make up a large number of structures in New Zealand’s building stock. They lack the capability to resist seismic actions in contrast to more recent structures using steel and concrete reinforcing as an integral part of the building fabric. They are predominantly one, two and three storey brick buildings built for commercial purposes before earthquake-resistant building design was introduced in the 1930s. Also included in this category are stone masonry buildings, churches and some important public buildings. Many URM buildings are treasured as valued records of our history and some continue to be used for the purposes for which they were built. Many others are now used as small-scale commercial premises much valued for their traditional character. Unfortunately these buildings are brittle in nature and if they have not been strengthened are particularly dangerous as they may fail in moderate earthquakes. Because they are constructed from heavy materials they may inflict injury, serious damage or even death when they collapse. Prior to the recent Canterbury earthquakes, it has been estimated that there were approximately 4,000 such buildings in New Zealand. Due to the effects of the earthquakes there may now be about 500 fewer. The collapses that have occurred as a result of the Canterbury earthquakes were mostly within the Christchurch CBD. Altogether 42 people lost their lives due to the failure or partial failure of URM buildings in Christchurch. Their collapse caused the death of pedestrians passing by; motorists; passengers on buses parked alongside a collapsing building and of people inside buildings that fell. In at least three instances failed buildings collapsed onto neighbouring buildings killing people inside. The Royal Commission sought advice on URM structures from Associate Professor Jason Ingham of the University of Auckland and Professor Michael Griffith of the University of Adelaide, on the performance of URM buildings in the Christchurch earthquakes. A report that they prepared for the Royal Commission, ‘The Performance of Unreinforced Buildings in the 2010/2011 Canterbury Earthquake Swarm’ (August 2011) has been published on the Royal Commission‘s website. The report covers the damage that resulted from the 4 September 2010 earthquake. The Royal Commission has requested the authors to extend their report to cover the consequences of the 22 February 2011 event. Chimneys – unsupported and unreinforced brick chimneys performed poorly with the majority of chimneys collapsing in domestic as well as small commercial buildings and some churches. Parapet failures – numerous parapet failures were observed along both building frontages and their side walls. Awning anchorage failures – falling parapets typically landed on awnings, leading to their collapse. Most awning supports in Christchurch involved a tension rod tied back into the building through the front wall of the building. In most cases the force on the rod exceeded the capacity of the masonry wall anchorage, causing a punching shear failure in the masonry wall identified by a crater in the masonry. Wall failures – inspections of out-of-plane wall damage typically indicated poor or no anchorage of the wall to its supporting timber diaphragm. It appeared that the walls were not carrying significant vertical gravity loads, other than their self-weight, as evidenced by the fact that the remaining roof structures appeared to be mostly undamaged (see Figure 7). Return wall separation – many buildings exhibited substantial cracking between their front wall and side (return) walls. This damage can be mitigated if stiff horizontal diaphragms are well connected to the wall in both directions. Pounding – several instances of damage due to buildings of different height pounding against each other during the earthquake were observed. The Ingham and Griffith report also describes the potential for strengthening buildings and techniques that can be employed. It gives the authors’ opinions on the level of strength buildings should possess to provide a reasonable ability to resist collapse. The Royal Commission has also studied the approach taken to lessen the risk of URM failure that has been followed in California, where similar forms of construction exist, and it will report on this. The Royal Commission will also discuss the performance of retro-fitted buildings in Christchurch in its Final Report. The Royal Commission will conduct a hearing on these matters commencing on 7 November 2011 and make recommendations in regard to URM buildings in the Final Report once it has considered all of the available material. It will also be considering and making recommendations on the existing legislative provisions for buildings that are (or should be) considered as ‘earthquake-prone’, the adequacy of existing legislative powers in relation to such buildings and whether the present allocation of functions between central and local government in this area are appropriate. However, the scale of the issue posed by URM buildings throughout New Zealand has caused the Royal Commission to make interim recommendations with the intention of reducing the current risk to public safety that these structures present. 1st stage: ensure public safety by eliminating falling hazards. This is done by securing/strengthening URM building elements that are located at height (eg, chimneys, parapets, ornaments, gable ends). 2nd stage: strengthen masonry walls to prevent out-of-plane failures. This can be done by adding reinforcing materials to the walls and by installing connections between the walls and the roof and floor systems at every level of the building so that walls no longer respond as vertical cantilevers secured only at their base. 3rd stage: ensure adequate connection between all structural elements of the building so that it responds as a cohesive unit rather than individual, isolated building components. In some situations it may be necessary to stiffen the roof and floor diaphragms, flexurally strengthen the masonry walls, and provide strengthening at the intersection between perpendicular walls. 4th stage: if further capacity is required to survive earthquake loading, then the in-plane shear strength of masonry walls can be increased or high-level interventions can be introduced, such as the insertion of steel and/or reinforced concrete frames to supplement or take over the seismic resisting role from the original unreinforced masonry structure. The level of the hazard that earthquakes present varies according to zones that are described in NZS 1170.5. The different hazard levels alter the degree of strengthening that will be required in different locations in New Zealand. However, the limited strength of URM buildings means that all URM buildings should be retro-fitted to some degree. The Royal Commission is of the view that steps should be taken to implement the first two of the stages described in the Ingham and Griffith report throughout New Zealand. It considers that action should be taken to implement the second stage in areas of moderate and high seismicity. These areas are where the hazard factor set out in clause 3.1.4 of NZS 1170.5 is 0.15 or higher. In both cases these steps should be taken as soon as practicable. As a first step in an improvement process it is necessary to identify all URM building stock in New Zealand. It is essential that the presence and characteristics of these buildings is known and the Royal Commission considers that such registers should be compiled (or, where they already exist, brought up to date) with urgency. The Royal Commission will give consideration to stages 3 and 4 discussed in the Ingham and Griffith report later in the Inquiry. 5. local authorities should ensure that registers of all URM buildings, their locations and characteristics, are compiled or, where they already exist, brought up to date. 6. throughout New Zealand, URM buildings should be improved by bracing parapets, installing roof ties and securing external falling hazards in the vicinity of public spaces. 8. these recommendations should be implemented as soon as practicable. 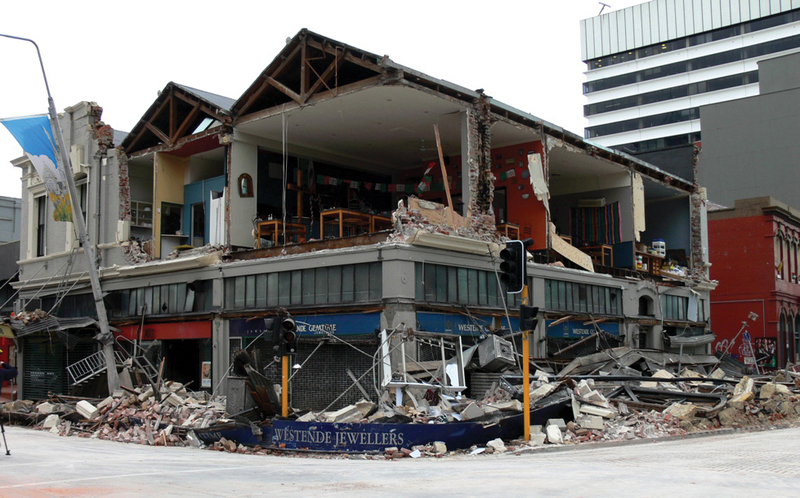 ‘Preliminary Observations from the Christchurch Earthquakes’, by John Hare, President of the Structural Engineering Society of New Zealand (SESOC). Before this report was submitted to the Royal Commission it was considered by the management committee of SESOC and input was obtained from a number of other specialist structural engineers. This report identified shortcomings in design codes and construction practice, which had been noted by structural engineers involved in the inspection of buildings in Christchurch following the earthquakes. We refer to this report as the SESOC report. Both reports have been placed on the Royal Commission’s website to make them available to interested structural engineers in New Zealand and elsewhere. The reports establish that there are aspects of structural design and construction which need urgent attention in the context of the imminent rebuilding work in the central Christchurch CBD. Two of the issues raised have public safety implications for multi-storey buildings wherever they are located in New Zealand; the first relates to stairs and the second to the use of mesh to transfer critical diaphragm forces. These are referred to in recommendation 10 and discussed under Issue 4 and Issue 7 in Annexure 1 attached to this section of the Interim Report. The issues raised involve changes to construction practice and to design standards (for example in NZS 1170.5). It is clearly important that the most pressing of the issues are addressed to prevent repetition in new construction of the same details that have been shown to have performed poorly in the Canterbury earthquakes. There is considerable urgency in taking action to avoid costly problems for the future. The Royal Commission divided issues raised in the reports into two groups. The first consisted of seven urgent issues, which could be considered within a short time period. The second comprised issues which either required more time for consideration, or were related to further work that the Royal Commission has initiated. The issues in this category will be addressed in subsequent stages of the Inquiry. The Royal Commission drafted a memorandum that addressed the seven issues that it considered should be dealt with urgently. The memorandum set out the issues, provided possible responses to them, and it sought feedback on these and other matters raised in the Stairs and SESOC reports. The memorandum and the two reports were then provided to all members of SESOC and to members of the Canterbury Structural Group. This resulted in the memorandum and reports being sent out to approximately 1500 practising structural engineers and senior university students interested in structural engineering. At a well-attended Canterbury Structural Group meeting one of the Commissioners briefly described the seven issues identified in the memorandum. Nine written responses were received by the nominated date. The seven issues are outlined in Annexure 1.
additional background information on each issue. The Royal Commission has considered the responses that were received to the memorandum. Of the responses to the seven specific issues, all the comments were supportive of the proposed actions, with one exception. The exception was where one contributor disagreed with the proposed action for Issue 2, which related to the need to allow for the effects of elongation on floors and the development of a method to assess diaphragm forces in floors. The submitter asserted that “item 2 – elongation and diaphragms is completely misleading”, and finished the comment by indicating that code provisions should not be required for a structural engineer to design diaphragms. The Royal Commission is not able to follow or accept his argument. 10. implementation of the guidelines (drawn up from recommendation 9 above) by CERA and the local authorities in greater Christchurch (as that term is defined in the Canterbury Earthquake Recovery Act 2011). (c) provide adequate statutory power for those purposes. The guidelines would apply in greater Christchurch until such time as national building standards have been revised to ensure the shortcomings in current practices have been adequately corrected. the vulnerability of stairs in multi-storey buildings designed to meet the minimum inter-storey drift requirements given in previous and current loadings standards (NZS 4203 and NZS 1170.5). This issue has been addressed in Practice Advisory 13, Egress stairs issued by the Department of Building and Housing when this report was in final draft.